This event continues NCRSS's mission to provide excellent Sandplay education with viewing the second film in our Sandplay Origins series: Sandplay with Dora Kalff. The film is fascinating as well as instructive with Frau Kalff in session with child patients. Teaching members Tessamarie Capitolo, MFT and Ellen Searle LeBel, MFT will also show and discuss excerpts from a Jung film, The World Within, showing his permeable influence in the creation of Sandplay therapy. This is a free event offering 3 CEU's, open to any therapist and member of NCRSS. 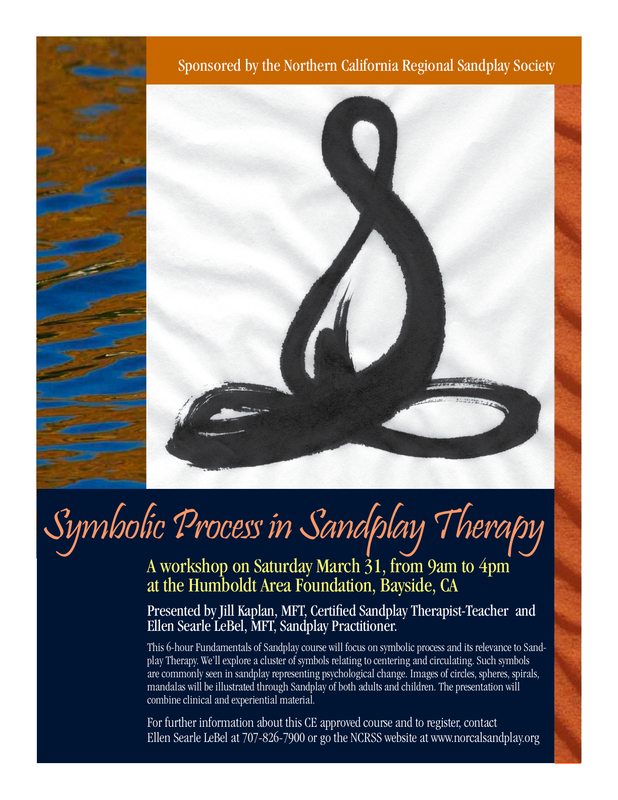 One of a series in the training program for the Northern California Regional Sandplay Society, this 6-hour intermediate course is for therapists who have taken introductory coursework in Sandplay therapy. The unconscious process of healing from trauma is revealed in two adult sandplay cases. We will follow themes of descent and ascent, expansion and constriction, chaos and centering, as the sandplay scenes symbolize the psyche's self healing through play and imagination. We will interactively observe and relate to the co-transference, witnessing the parallels of progression and regression in the attachment to the therapist. 6 CEUs will be provided. The Northern California Regional Sandplay Society plans to offer further Sandplay Therapy training in Fall 2015. Details will be available soon. Please contact me if you are interested in workshops, consultation or experiencing your own process in the sand. The International Society for Sandplay Therapy recommends that all therapists offering sandplay experience a personal process with a trained practitioner. Having your own therapeutic experience of sandplay therapy deepens your understanding of yourself and the healing process in the sand. Read more about it on this website under Sandplay Therapy. Please contact me if you would like more information about sandplay for yourself or training to work with clients. "Symbolic Process in Sandplay Therapy"
mandalas are illustrated through Sandplay of both adults and children. The presentation combines clinical and experiential material. This was an inaugural course in Humboldt County which will lead to further training and continuous course offerings in order to meet requirements for Sandplay Therapy certification. It is with great excitement that I am part of this opportunity for therapists in far Northern California to have a training program that is very difficult to find locally. Saturday March 31, 2012. Bayside, CA. Ellen LeBel, MFT, Sandplay Practitioner. For further information about this CE approved course, contact me via email, call (707) 826-7900 or see the NCRSS website. "Symbolic Literacy: Look at Your World in a New Way"
Do you notice the symbols surrounding you? How are our everyday symbols similar or distinct from those of other cultures? Symbolic literacy is fun to learn and apply. Learning the language of symbols gives us insight into other cultures, history, the arts, literature, mythology and our personal lives. This course offers a variety of resources for researching symbols online, in libraries and through hands-on experiences. You select symbols to explore both in class and independently. Share discoveries and collections of symbols with their definitions and associations. The goal is to appreciate the ways we constantly interact with symbols and how they enrich our inner and outer lives. All Wednesdays in February, 2011. Eureka CA. In this 2 hour workshop session, we explored the personal and collective experience of symbols through improvisational movement using sandplay figures. Sandplay Therapy Institute. October 15-17, 2010. St. Paul, MN.